Get ready, Comic-Con fans—The Topps Company is returning to San Diego, and they’re bringing exclusives with them! Hosted by Atomic Toybox Entertainment, Topps will be appearing at booth 4120, exhibiting at San Diego Comic-Con for the first time in 5 years. To celebrate their return, Topps has created an all-new Garbage Pail Kids character, “Comic Conner,” who will appear on a show exclusive limited edition T-Shirt available for just $20. Topps will also be giving away an exclusive “Comic Conner” promo card– which will be strictly limited and available on a first-come-first-served basis. Also exclusive to the show are a set of 11×14 jumbo Garbage Pail Kids trading card prints, perfectly suitable for framing, and feature 6 popular “GPK” characters including “Comic Conner.” These jumbo card prints will be priced at $10 each or all 6 for just $40 (while supplies last). With all the excitement over Garbage Pail Kids, we almost forgot that the Topps’ dastardly Martians will also be invading San Diego! That’s right, Topps will be hosting a MARS ATTACKS TRADING CARD SCAVENGER HUNT! Consisting of 9 exclusive free connecting puzzle cards, the set features all-new art by Chad McCown and is the first official continuation of the 2013 card series, Mars Attacks: Invasion! The first card will be given away FREE at the Topps Booth (4120), with subsequent cards handed out free at a variety of other booths around the show. The back of each card will point convention-goers to the location of the next card in the series (fans can also find the full list of booths by visiting www.facebook.com/MarsAttacks). 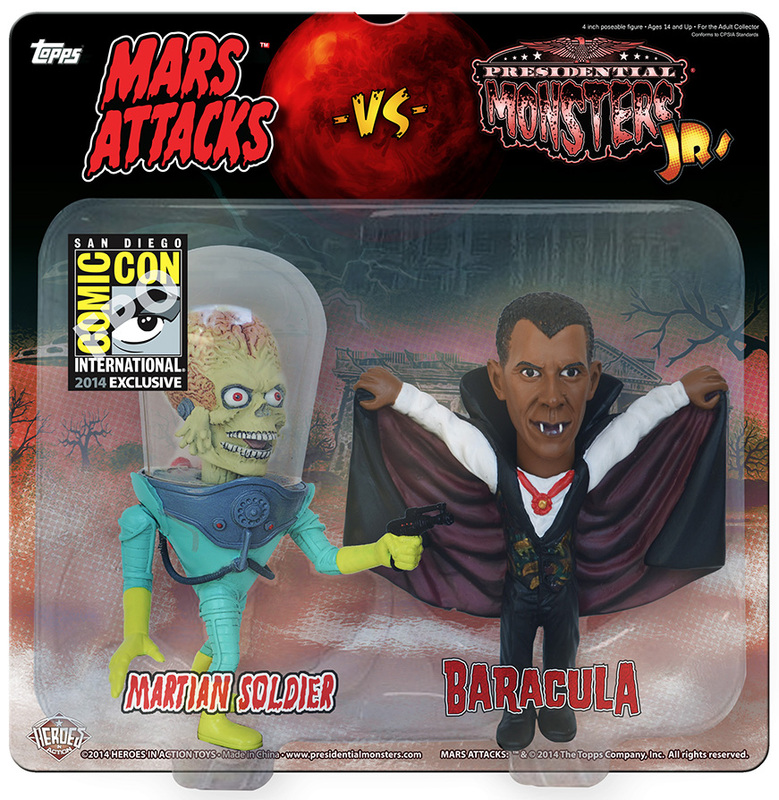 Speaking of exclusives, Heroes in Action (booth 3450) will have a Mars Attacks vs. Presidential Monsters 2-Pack featuring a Martian soldier facing off with “Baracula,” one of Heroes In Action’s most popular characters. This 2-pack figure set is exclusive to San Diego Comic-Con. Fans of course will also be able to buy all the latest Topps collectibles and trading cards at the Topps booth: from Star Wars, Doctor Who, WWE and Skylanders to Garbage Pail Kids, Mars Attacks and Wacky Packages! See you at the show— Booth 4120!